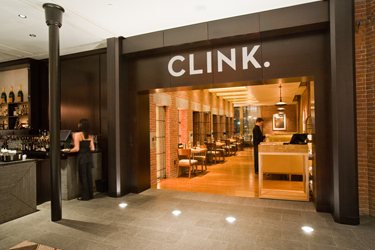 Set on the lobby level of The Liberty Hotel, a national historic landmark that was once the storied Charles Street Jail, Clink. offers urban dwellers and hotel guests a menu of tapas-style small plates, tasting pours of wine and exotic cocktails. The concept aims to create an energetic, social environment where dining and meeting for drinks occurs throughout the space, an adaptable place where dinner at the bar or just cocktails at a table is the norm. Executive Chef Joseph Margate's menu showcases his classically-trained European technique coupled with the freshness of in-season American ingredients. The National Historic Landmark building which houses Clink. is one of the country's most stunning and inspired "reuse" developments and sits at the foot of Boston's historic Beacon Hill neighborhood boutiques.